China has refuted claims by United States leaders that "the U.S. really rebuilt China", saying that the development of any country ultimately depends on itself. 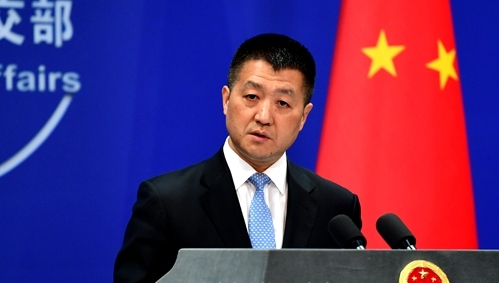 Foreign Ministry spokesman Lu Kang said at a news briefing on Wednesday that China mainly owes its tremendous achievement in development to the correct leadership of the Communist Party of China and the path of socialism with Chinese characteristics, the country's unwavering efforts in pushing forward reform and opening up, as well as the diligence and wisdom of the Chinese people. The claim by U.S. leaders that attributes China's achievement to chronic trade surpluses in Beijing's favor is logically untenable, he said. Rather than pursuing development within a vacuum, China has always kept its door wide open to conduct win-win cooperation with different countries, he added. "As a country with a population of close to 1.4 billion, it is impossible for China to rely on the charity of others for its development. I am afraid that there is simply no country with such capabilities to rebuild China," he said. Lu said the U.S. trade deficit with China is a result of comparative advantages of China and division of labor factors. China's foreign trade has always been in line with market principles and conducted fairly. The U.S. buys more from China than it sells, and it also has self-imposed restrictions on exports of some products, which has naturally resulted in deficits, he said. "It is unfair and improper that the U.S. denounces China on these grounds," Lu said. Meanwhile, bilateral trade between China and U.S. is by no means one way traffic that transports wealth to China, he said, adding that the U.S. has long gained wide and tremendous economic benefits from business and trade cooperation with China. "Nobody is willing to make deals destined to lose, not to mention for 20 years," he said. China urges the U.S. to adopt the right mentality, respect facts, stop groundless accusations against China, and do more to benefit businesses and consumers, Lu said. Estimates by the U.S.-China Business Council last year showed trade with China saved typical U.S. families up to US$850 in 2015. A report released by Deutsche Bank in June said that even though China enjoyed a US$376 billion trade surplus with the U.S. in 2017, Chinese consumers own more iPhones and buy more General Motors cars than U.S. consumers do. "These cars and phones are sold to China not through U.S. exports, but through Chinese subsidiaries of U.S. multinational enterprises," the report said.